The Yotaphone 2 isn't your average smartphone. It sports not one, but two displays with a normal 5-inch offering on the front and an always-on, 4.7-inch touchscreen E-Ink screen on the rear. And now it's even more attractive. It's not the perfect smartphone, we found several gripes with it in our review, but the Russian firm has improved the interface making it easier to use and more feature rich. 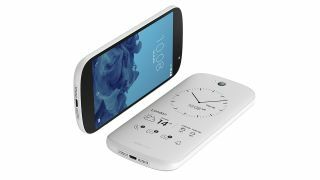 A software update is currently winging its way to all current Yotaphone 2 owners, and for those of you looking to buy one you'll find it now also comes in white as well as black (from May 14). There's more good news too as the price has been slashed by £115 (€100 in Europe), meaning you can now pick up the Yotaphone 2 for £440. That's still a fair investment, but as already mentioned it's been given a range of upgrades thanks to the new software update. The software update includes the freshest version of Google's mobile platform, Android Lollipop, and you'll find the colours on the E-Ink screen of the white model have been inverted to give a lighter, brighter appearance that's more in keeping with the handset's hue. With a white dominance it also means screen refreshes in this inverted mode are quicker, resulting in less wait time as the E-ink redraws. Most of the software enhancements in YETI 2.0 (Yota E-ink Technology Interface) are focussed on improving the rear screen performance, with the introduction of a centralised home button for easier navigation and better control over covers and panels. Notifications on the E-Ink display have been made bigger while text message interaction has been improved with the Yotaphone 2 able to select one of around 70 stock images to display alongside a message after scanning the text. New apps including YotaNotes, YotaSports, YotaFitness, Shazam-a-like MusixMatch and a remote which works with Samsung and LG smart TVs have also been added to the back display. The Yotaphone 2 can also take advantage of a new library of books, with Bookmate offering a subscription service of over 500,000 texts, of which over 100,000 are in English. We'll be putting the new software through its paces when you get a device in, so keep an eye on our review for the update.